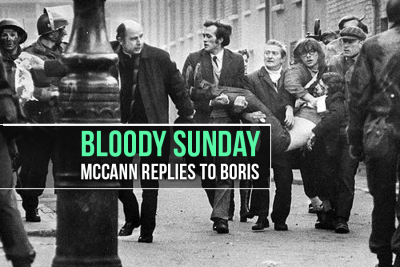 The toxic clown Boris Johnson has told the Daily Telegraph that “it feels sickening” that charges might be brought against some of the paratroopers who killed or wounded 28 unarmed people in Derry on Bloody Sunday in 1972. He’s become very delicate all of a sudden. In fact, some of the soldiers likely to stand in the dock might reasonably feel sickened themselves that they are being made to carry the can while those who gave them their orders or provided political cover are allowed to slouch off scot-free. In a sense, he’s right. The killings were political. The long campaign to have the killers brought to book was political. The selection of soldiers to be charged was political. The fact that there will be no generals in the dock is political. The political motive on the day was to smash “Free Derry.” Military and intelligence documents from the period released by the Saville Tribunal show that the most senior commanders in the North were seething with outrage that “hooligans” had taken over part of the town and shut out the forces of law and order. The great unwashed, the hoi polloi, had taken over. This was the source of the establishment’s rage which they sent the soldiers in to unleash on the people. It had at least as much to do with class as with any consideration of nationality or communal identity. In 2012, two years after publication of the report, the PSNI launched a criminal investigation into the Derry events. They didn’t do this out of any pristine belief in due process, but because it had become clear by then that the issue of prosecuting the perpetrators was not going to go away. The PSNI passed the file to the Public Prosecution Service in 2014. It’s taken a further five years for the authorities to decide on the next step. The obvious reason both for the delay and for the eventual decision to prosecute is that the evidence was overwhelming. Nobody could read the transcripts of the hearings before Saville and come to any conclusion other than that the paras had done what Derry civilians said they had done. The top brass and their political associates eventually came to the conclusion that the evidence was too glaring to be kept in the dark. It would have been positively perverse for the PPS to have arrived at any other conclusion. For all the raging controversy it has provoked for almost half a century, the Bloody Sunday case is pretty straight-forward: hundreds of people witnessed men with guns killing people without guns in broad daylight. In essence, that’s it. The fact that it has taken so long to have this acknowledged is a measure of the depth of the establishment’s reluctance to allow daylight to fall on the facts when the facts don’t suit them. That they have backed off a bit and sanctioned prosecutions represents a huge victory for the families who decided to keep right on to the end of the road when they were being urged on all sides to call a halt. In the immediate aftermath of publication of the Report in June 2010, Nationalist parties in Derry were telling the relatives that, “This is as good as it gets,” that there was no point pressing on, that Saville’s would have to be the last word. Sinn Féin was instrumental in having the annual Bloody Sunday March abandoned. If everyone involved had followed the Nationalist leaders, there’d be no pending prosecutions for Boris Johnson to blather about. Like so many other Irish atrocities, the awkward truth would have been swept under the carpet. We owe it to the few who refused to back off that we may now be closer than ever to the truth.